Get the tools to meet the challenge of building or renovating a library! The challenge of renovating or constructing a library requires organizational skill, resourcefulness, creativity, and willingness to compromise. Planning, Renovating, Expanding, and Constructing Library Facilities in Hospitals, Academic Medical Centers, and Health Organizations presents thirteen insightful case studies revealing how many libraries have been have been built or renovated using innovations designed to meet a specific organization's needs. Each study plainly highlights objectives, methods, results, and conclusions, and reviews the design of the completed library. Ideas and approaches are presented clearly, showing the designing, refurbishing, and refurnishing of existing library space; the merging of library collections and services; and the construction of multimillion dollar library buildingswith each study explaining proven strategies which can be used or adapted to fit the reader’s own circumstances. Planning, Renovating, Expanding, and Constructing Library Facilities in Hospitals, Academic Medical Centers, and Health Organizations explains the steps in the planning process, including needs analysis, goal setting, and public relations, as well as the practical considerations of packing and unpacking. The contributors are noted library authorities intimately involved in every facet of the construction procedure and cost accounting, and the book includes helpful photographs, illustrations, tables, and appendices to clarify and help practicing librarians and library students alike fully understand the strategies needed to create a functional library facility that fulfills expectations. 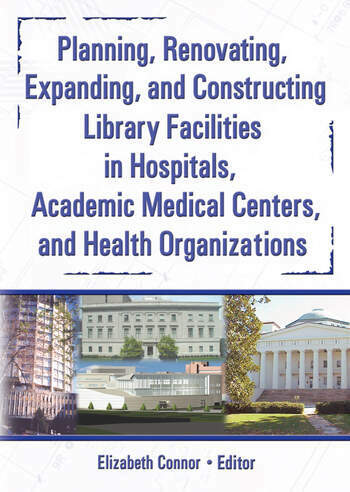 Planning, Renovating, Expanding, and Constructing Library Facilities in Hospitals, Academic Medical Centers, and Health Organizations is an insightful resource for educators, students, and librarians of all types.